The Saints have run out 18 point winners over a spirited Demons line up. The Dees were in it up until mid way in the final term, where their avenues to goal had dried up. A good win by the Saints. The Dees have shown some great signs tonight, but their last quarter has let them down, where at a point, they looked like they could steal the game. GOAL SAINTSDal Santo kicks to a leading Riewoldt, who marks 15m out directly in front. 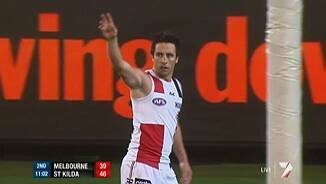 He kicks his second goal of the night and shuts the gate on the Dees. Melbourne have yet to register a score this term, with the Saints adding one goal three behinds. Time is becoming a factor that is working against the Demons, who are 12 points down. BEHIND SAINTSRiewoldt goes long into the forward line and finds Goddard 40m from goal 5m in from the boundary, he steps in and kicks it offline for a point. The Saints are in the box seat and one feels that one more goal will be enough to put the Dees away. GOAL SAINTSHayes roves the ball beautifully, he baulks two tacklers, looks up at goal and splits the middle to give the Saints an 11 point lead. Dal Santo drops an easy mark inside 50, he recovers as he goes to kick the ball, but a brilliant smother from Bail saves the day. Great play by Grimes, with a clearing kick from the last line of defence and manages to keep it in play. It has been such a tight final term, that the next goal could give the team that kicks it a huge psychological advantage. Blake has gone off the ground and up the race, having his knee assessed by the trainers. BEHIND SAINTSStanley marks 55m out, he takes the set shot but off hands it goes through for a point. Moloney attempts to sell some foot candy, but makes a mess of it and the free kick is given to the Saints. BEHIND SAINTSGoddard gathers the loose ball, kicks it around the corner and is offline. The first goal of the term is an important one in terms of momentum. Nathan Jones limping off for the Dees is not a sight that they wanted to see, as he has been their most potent forward tonight. The Goddard move looks already to have paid off for the Saints, as he has gathered two possessions, within a minute. We are back for the final term, as Goddard has been moved forward in an attempt by the Saints to get him into the game. The Saints hang onto the lead to the tune of three points at the final break, but the might of the red and the blue are coming at the Saints and coming at them hard. GOAL DEMONSYes they can! Sellar keeps the ball alive, hands it off to Bartram, who puts the jets on and kicks the goal that the Dees wanted! Can the Dees get one more goal before three quarter time to bring themselves back to within three points? McKenzie has done an impressive job on Goddard, who is starting to show signs of frustration. There is more than enough time left for either team to score a goal before the final break. BEHIND DEMONSGarland thumps it long into the goal square, but it goes through for a point. SUBSTITUTION DEMONSThe decisions get stranger, as the Demons substitute their last goal kicker, Dunn in place of Sylvia. BEHIND SAINTSPolo kicks it deep into the goal square and off hands it goes for a point. GOAL DEMONSDunn marks 45m out directly in front, he backs himself to kick the goal and he does exactly that, to bring the Demons to within nine points. It will be interesting to find out whether the Saints decision to sub Wilkes was a planned one or not, as he has been on fire tonight. SUBSTITUTION SAINTSIncredible scenes as the Saints activate their sub, Dean Polo, in place of their best forward of the night Beau Wilkes. BEHIND SAINTSWilkes takes the front position against Dunn and takes the mark 45m out on a slight angle. He starts the kick right and it stays there. The game is in the balance, as the lead is out to 15 points in favour of the Saints. 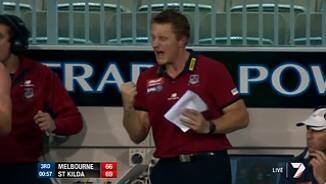 The Dees desperately need the next goal. GOAL SAINTSWilkes marks 50m out, near the boundary. The kick is a difficult one, as he kicks it perfectly through for his third goal of the night. BEHIND SAINTSMilne bends it around the corner and squeezes it through for a point. It is about the right time in the game that some fresh legs may be injected for either team. The Dees have steadied after the Saints burst out of the blocks early in the third term. A goal wouldn't harm their cause. BEHIND DEMONSMoloney accepts the handball, heads for home and sprays the shot to the right. Magner has hurt his left knee, buckling underneath him. He is getting it strapped up in the rooms and will be back on the ground soon. The Saints continue to push up forward, but the Dees are resisting their every attempt to score a goal at the moment. Goddard has been extremely quiet, gathering just his seventh possession for the match. BEHIND SAINTSRiewoldt gathers the loose ball, has a quick shot on goal and it bounces the wrong side of goal. GOAL SAINTSSteven takes the ball, steadies, times his shot perfectly and kicks the first goal of the second half. We are back under way for the second half. The siren sounds to end the first half, with the Saints leading by two points, in a term that was dominated by the Demons. 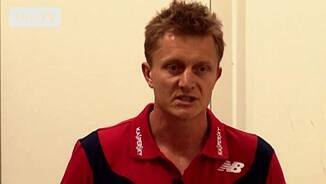 DEVELOPING NEWSRiewoldt is on the bench and is complaining about his shoulder, as the physio discusses it with him. It could be worst than first thought. A good sign for the Dees is that they are continuing to win the contested ball. The Saints are back in the lead and are starting to hit their straps, late in the second term. GOAL SAINTSGreat pressure by Milne, as he is rewarded with a free kick for his tackling pressure. He goes for goal and kicks his second goal of the night and 500th for his career. Warning bells sound for the Saints as Riewoldt clutches his shoulder behind play, he looks to be okay though. GOAL SAINTSMontagna works it forward and heads for home to give the Saints just what they needed, a goal. GOAL DEMONSHowe turns Blake inside out, as he hands it off to Bail, running into 50 and clears the goal square to give the Dees a 10 point lead. 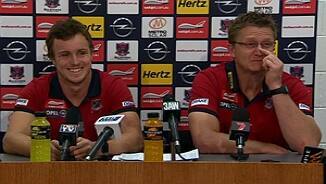 All of the Dees moves this term has been gold, they have all worked and the Saints are under the pump. If the Dees can get away to a two to three goal lead before half time, they will be in the box seat for the second half. The Demons have been inspired by Jamar, who has 21 hitouts to his credit. GOAL DEMONSDavey bounces a shot at goal and it is through, the Dees take the lead. The Dees have been really impressive, with the Saints turning it on only when they need it. BEHIND SAINTSThe ball spills from the pack to the goal square, Milne soccers it through for a goal, but a goal review is called and it is ruled a point as it went the wrong side of goal. Nathan Jones gathers it once again, looks at goal and this time he kicks it out on the full. GOAL DEMONSBail with some good work from the stoppage, as he puts boot to ball and splits the middle. GOAL SAINTSThe Dees turn it over as the ball ends up with Milne, who says thank you very much for his 499th career goal. 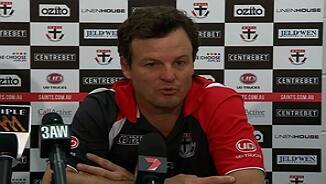 It has been all Melbourne in the second term, the Saints are looking very unstable at the moment. GOAL DEMONSGrimes tackles Dal Santo as Grimes intercepts his handpass, grubbers it for goal and the Dees trail by a point. BEHIND DEMONSJones kicks around the corner and it is punched through for a point. The Dees have been good this term, but are yet to post a major onto the scoreboard this term. BEHIND DEMONSA great build up by the Dees ends up in disappointment as Howe misses a sitter from 35m out directly in front. The Dees have conceded that Watts is not up for the Fisher challenge, after conceding 10 possessions in the first term. They have moved the moustached one, Dunn onto him. We are back for the second term, as the umpire throws the ball up to start the quarter. The Saints go into the first break with a hard fought nine point lead over a much more determined Melbourne team. The rain starts to come down in buckets at the G, making conditions a little slippery. GOAL SAINTSStanley gets the front position and marks 45m from goal directly in front. The kick off the boot looks a little groggy, but it comes around for a goal. GOAL DEMONSJones works hard to be front and centre, he kicks another goal against all odds, to keep the Dees in it. GOAL SAINTSRiewoldt finds some space and marks 25m from goal, he kicks an easy goal, to give the Saints a nine point lead. BEHIND SAINTSDal Santo with a quick shot on goal, it misses, however it goes for a review, with the result standing as a miss. GOAL DEMONSJones plucks something out of nothing, as he smashes a long shot on goal to bring the Dees back to within two points. Bate with the perfect one arm tackle, is rewarded with the free kick on the wing. BEHIND SAINTSRiewoldt heads for home as it bounces for goal but through the wrong side of the goal post. The Demons continue to tackle hard, but are letting the Saints off the leash a little in the centre clearances. GOAL SAINTSWilkes takes the mark 40m out on the boundary, he kicks it beautifully for his second goal of the night. GOAL SAINTSSteven gathers the loose ball, shakes off the tackle, snaps around the corner and bounces it through for a goal. The Saints have hit the lead. BEHIND DEMONSJones pushes Davey in the back after kicking the ball, the umpire awards the free kick, giving Davey another shot on goal, with the same result, a point. Montagna with an accidental elbow to the face of Magner, forces him off the ground with the blood rule. Dal Santo thumps it down to the middle of the ground, as the Saints take it away from danger. It will be interesting viewing, to see the game plans of both coaches tonight, both Mick Malthouse prodigees, in their first year of coaching as well. The Dees lose it in attack as the Saints rebound from half back. McEvoy is awarded the free kick after an off the ball incident where Rivers got involved with him, he takes the kick 40m from goal and he puts it out on the full. It appears that the Saints have steadied, after being trumped at the start of the game. GOAL SAINTSMilne kicks it to the lead of Wilkes who marks 35m out on a slight angle and he kicks only his second career goal. An interesting role for former number one draft pick Jack Watts, who is playing a negating role on Sam Fisher. GOAL DEMONSBate fends off his opponent, as he marks the ball in the goal square, plays on and goals. BEHIND SAINTSMacDonald pushes Riewoldt in the back as the umpire awards the free kick, Riewoldt plays on and hits the post. GOAL DEMONSMoloney gathers it from 48m out he pulls the trigger and splits the middle. It is just the start that the Demons wanted. BEHIND SAINTSDal Santo kicks it over the top to Milne, who runs towards goal and hits the post. The umpire steps in and slams the ball into the middle of the ground, we are under way. The subs for today are the returning Sylvia for the Demons and Polo for the Saints. Welcome to the MCG for the clash between Melbourne and St Kilda. A late change for each team, with Tapscott replacing Frawley for the Dees and Newnes is out with Wilkes coming in.